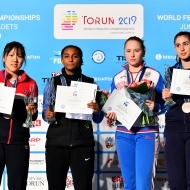 TORUN, Poland, April 12, 2019—France’s Arthur Philippe and Italy’s Federica Isola took individual junior epee gold medals at the 2019 Junior and Cadet Fencing World Championships on the seventh of nine days of competition in Torun, Poland. In all, 195 men and 157 women participated in the day’s events. Philippe fenced Italy’s Davide Di Veroli in the final round of the individual junior men’s epee competition, winning by two touches with a 15-13 score. Di Veroli overcame his teammate, Gianpaolo Buzzacchino, in the semi-final match, 15-10, and Philippe beat Azerbaijan’s Rusian Hasanov, 15-7. Isola and her teammate, Gaia Traditi, faced each other in the gold-medal round of individual junior women’s epee, with Isola winning, 15-12. Traditi eliminated USA’s Greta Candreva in the semi-final, 15-10, while Isola defeated Korea’s Sieun Kim by a single point, 15-14. The final eight in junior men’s epee included Arthur Philippe (FRA, gold), Davide Di Veroli (ITA, silver), Gianpaolo Buzzacchino (ITA, bronze), Rusian Hasanov (AZE, bronze), David Nagy (HUN), Seraphim Hsieh Jarov (CAN), Stephen Ewart (USA) and Taeyeong An (KOR). 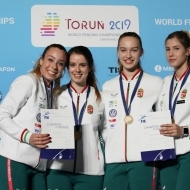 The final ranking in junior women’s epee included Federica Isola (ITA, gold), Gaia Traditi (ITA, silver), Greta Candreva (USA, bronze), Kim Sieun (KOR, bronze), Emily Vermeule (USA), Karoline Loit (EST), Evgeniya Zharkova (RUS) and Beatrice Cagnin (ITA).